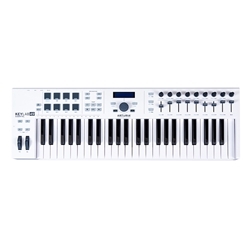 This 49-key controller keyboard was designed for maximum performance and expression, with velocity and aftertouch in addition to a bevy of knobs, faders and highly responsive pads. The back panel connections include breath controller, MIDI in/out, expression and sustain pedals and an aux pedal input. This is a top-notch controller for any hardware or software, but its comprehensive control of our Analog Lab software is the piÃ¨ce de rÃ©sistance: its preassigned controls make this combination the perfect hybrid solution for plug-and-play sound creation. Analog Lab boasts a huge library of 5000 internationally-designed presets, so instant inspiration is only a click away. Play several sounds at once in Multi mode, and add a professional touch with a wide range of high-quality effects. With an unprecedented level of synthesis control, Analog Lab lets you fully experience the depth Arturia’s TAE analog modeling technology.